Want to be notified of new releases in NVIDIA/nvidia-docker? The full documentation and frequently asked questions are available on the repository wiki. 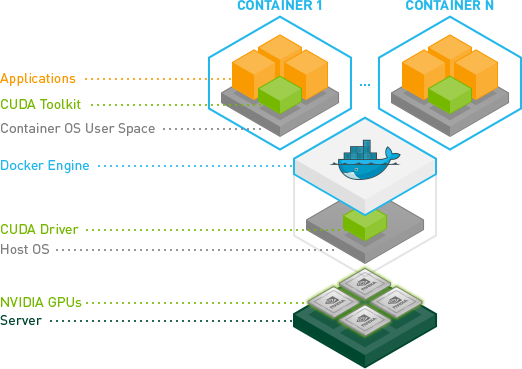 An introduction to the NVIDIA Container Runtime is also covered in our blog post. Make sure you have installed the NVIDIA driver and a supported version of Docker for your distribution (see prerequisites). If you have a custom /etc/docker/daemon.json, the nvidia-docker2 package might override it. Ubuntu will install docker.io by default which isn't the latest version of Docker Engine. This implies that you will need to pin the version of nvidia-docker. See more information here. If you are not using the official docker-ce package on CentOS/RHEL, use the next section. If yum reports a conflict on /etc/docker/daemon.json with the docker package, you need to use the next section instead. For docker-ce on ppc64le, look at the FAQ. # You can't use `--runtime=nvidia` with this setup. Look at the Installation section of the wiki. Update nvidia-docker to adress runc critical vulnerability that allows specially-crafted containers to gain administrative privileges on the host.